The Liberal leadership contest enters its home stretch Saturday with a Toronto event the party is calling its National Showcase. So far ticket sales have been slow - perhaps because the leader won't be chosen until a week later. The Liberal leadership contest enters its home stretch Saturday with a Toronto event the Liberal Party is calling its National Showcase, where the six remaining candidates will make their final pitch to voters. But so far, not many tickets have been sold. Ian McKay, the Liberal Party's national director, told the media at a briefing Wednesday that the showcase is a mini-convention, a "happy time for Liberals," which will last for one afternoon. But the tension and drama of past leadership conventions will be absent, since a leader won't be announced until a week later. CBCNews.ca will carry the Liberal showcase live starting at 12 noon ET, with a live blog and livestreaming video. You can also watch the even live on CBC News Network. The venue for the showcase, Toronto's Metro Convention Centre, has a 1,500-seat capacity, but a Liberal Party spokesman said as of Wednesday night, only 219 of the $150 tickets had been sold. One leadership candidate said the top ticket price is out of reach for some families. McKay said he expects all 1,500 seats will be filled. Cheaper tickets are available to party members who belong to the Liberals' Victory Club and Laurier Club, or for Liberal youth members. Observers, who are often people from other political parties, will have to pay $499 to attend. Each of the six candidates will be allocated 100 seats for their own supporters and cheering section, but it's not entirely clear if the candidates have to pay for those tickets. One candidate thought the tickets might be free, but a long-time Liberal Party member said it would be ridiculous for the party to allow 600 tickets to be given away for nothing. A party spokesperson said candidates may be able to request more than 100 tickets for their supporters, organizers and volunteers. Some candidates, such as Deborah Coyne and Karen McCrimmon, who have raised very little money, may not be able to afford many tickets. The doors open at noon ET Saturday and events will kick off shortly after 1 p.m. with a tribute to interim Liberal Leader Bob Rae, followed by a speech from Rae. The Rae tribute will be introduced by former prime minister Paul Martin. Between 2 and 5 p.m., the six candidates will speak, and some may give video presentations or have supporters speak to the crowd. McCrimmon said she intends to speak for only 15 minutes, although every candidate is allowed 25 minutes. "I'm one of those people who believe if you can't say it in 15 minutes, you're going to lose them anyway," she said an in interview Thursday. McCrimmon is working on a "low key, technology-wise" homemade PowerPoint presentation to use during her speech. The order of speakers will be Coyne, McCrimmon, Joyce Murray, Justin Trudeau, Martha Hall Findlay and Martin Cauchon. Once the event ends, registered voters attending the showcase will be able to vote. Others will be allowed to vote starting Sunday, online or by phone using a PIN number, until Sunday, April 14. 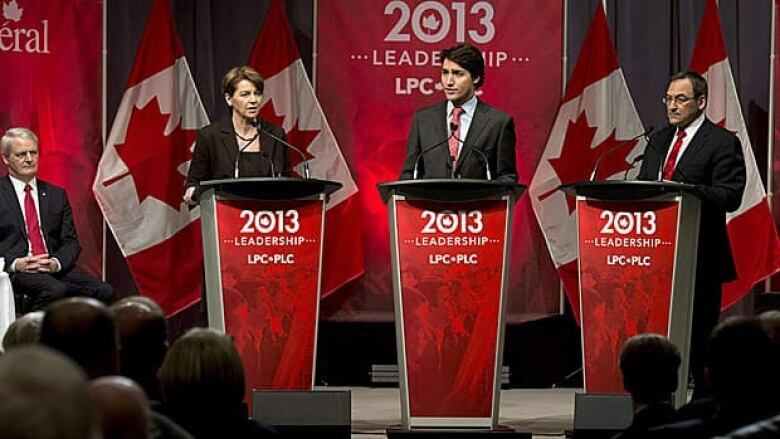 On April 14, the new Liberal leader will be announced in Ottawa during the early evening at an event at the Westin hotel.